The British Council Visual Arts Department is a dedicated team of specialists, committed to promoting the achievements of the UK’s best artists abroad. 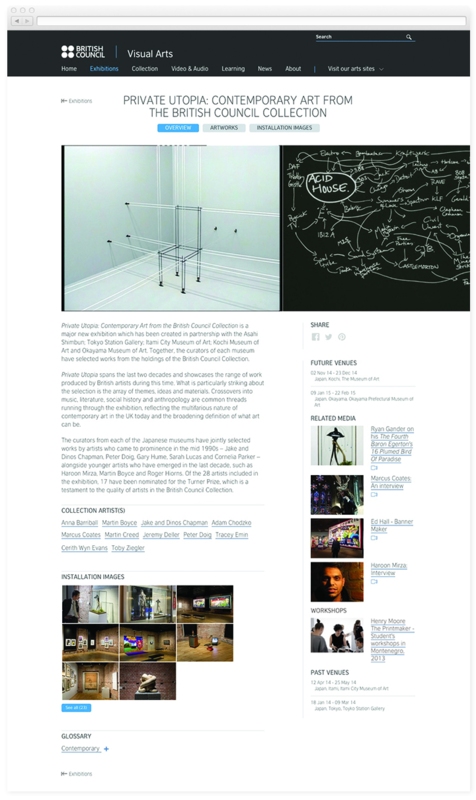 Primary activities include exhibitions, training and development, professional study exchange visits and the sharing of our unrivalled knowledge and advice on the logistics of working internationally in the visual arts and museums sector which are all reflected on a constantly adapting and evolving web presence. The Online Collection website was re-created in 2006 with a vision to showcase the global resource which is used to create displays and exhibitions for all parts of the world, as there is no permanent display of the collection we call it a ‘museum without walls’. 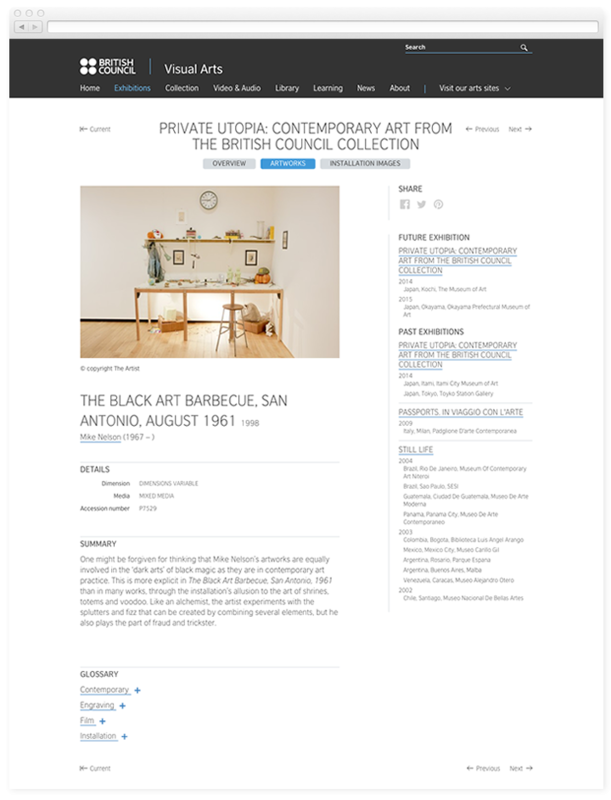 In 2011 the website was extended and relaunched together with an improved collection management system which included all of the British Council Visual Arts activities. 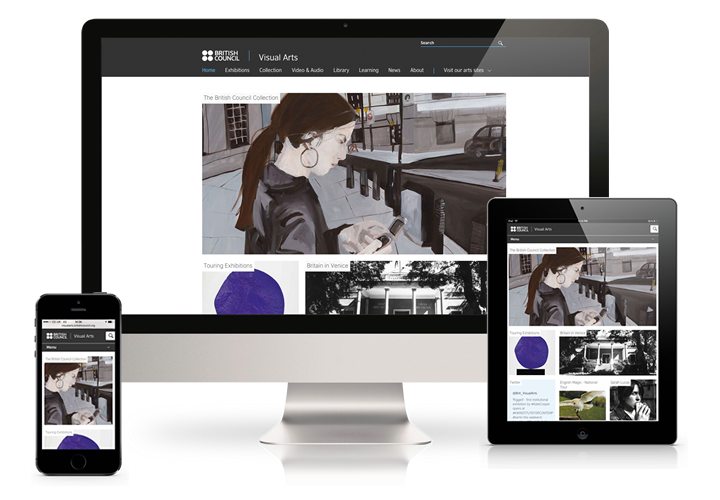 In 2014 the website was redesigned becoming fully responsive and now includes a professional library with extensive coverage of developments in the British art of the 20th and 21st century. The home page provides entry points to featured content and live twitter feeds. 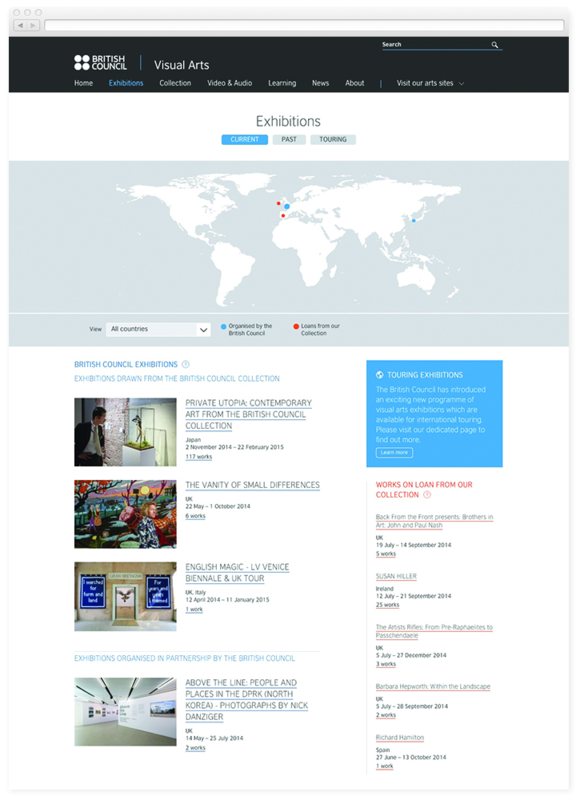 The British Council creates many opportunities to promote British art: the map on the top offers a view at a glance of worldwide activities, visitors can find current exhibitions organised by the British Council and artworks on loan to other institutions. Individual exhibitions feature one or multiple artists from the collections and travel to one or multiple venues. 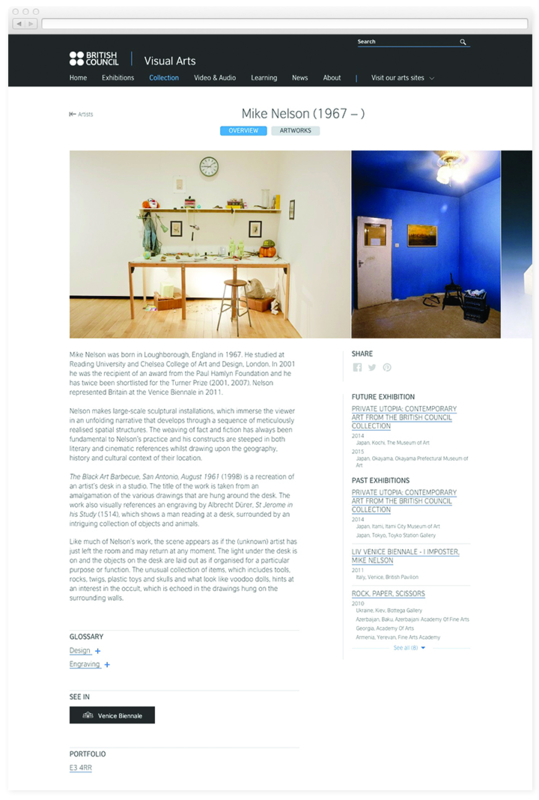 Individual exhibition pages focus on works included, venues, artists, installation images, video tours, description and review and (if available) a PDF catalogue to download. 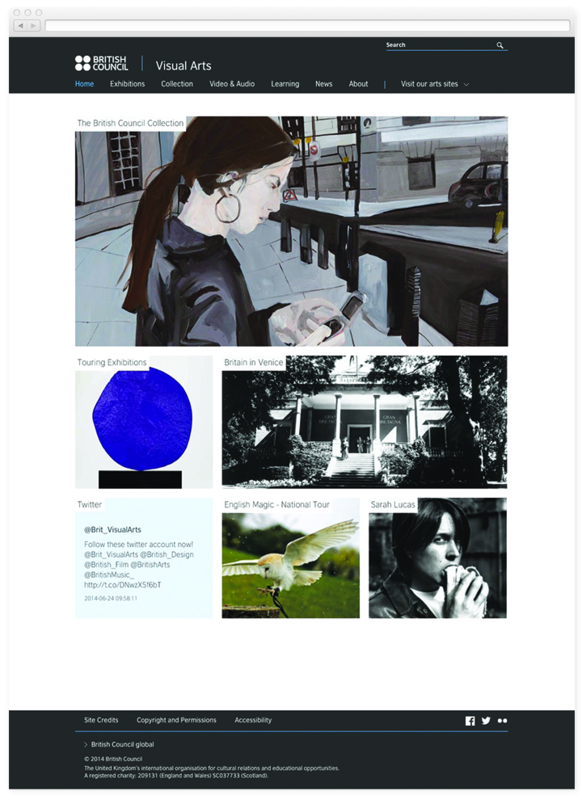 The vast majority of the British Council Visual Arts activities is focussed on the works in their collection. On the website, each work becomes both the destination of each journey as well as the beginning of new narrative paths: artists, exhibitions, portfolios, etc. Similarly, artists are fulcrums of connections to exhibitions, works, projects and other events. As most of the collection focuses on contemporary art, artists are alive and contributing presences. 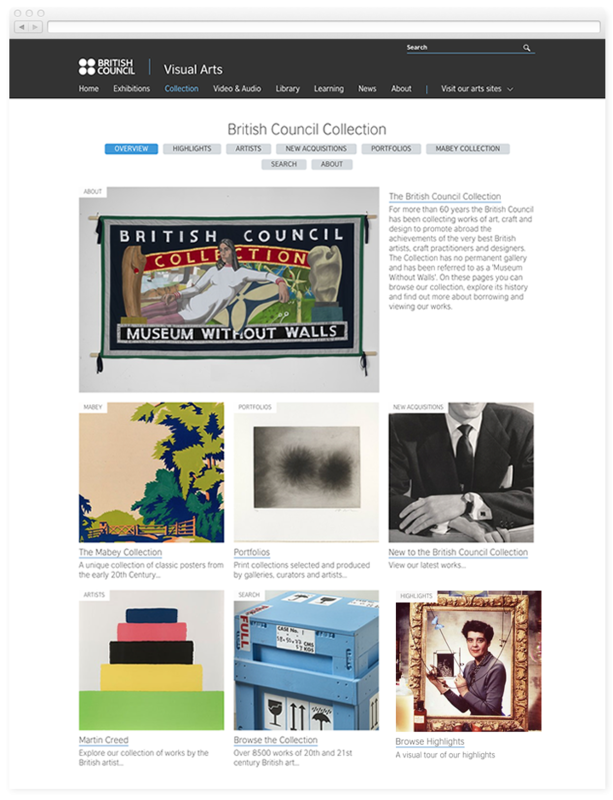 The landing page to the collection offers multiple ways to explore the over 9,000 works of contemporary British art owned by the institution. Visitors can browse highlights, new acquisitions, thematic portfolios or use the search tool to dig deep into the Collection’s archive.